Andre the Giant has 5 reels and 25 pay-lines. It is a game based on the popular wrestling characters which managed to gain his fame thanks to its big size. The slot machine allows you to trigger two special bonus features, there is a big 5,000 coins jackpot and at the end of each playing round there is the possibility to activate the gamble feature. The first feature you can activate while playing this video slot game from NextGen Gaming Casino’s is called “Andre goes wild feature”. This is an expanding wild feature and the Andre symbol will expand and cover the whole reel where it appears. It can provide you with a very nice set of winning combinations, as it can substitute any symbols you need. The second feature available is called “Battle Bout Bonus”. This is a free spins bonus round where you can win some significant prizes. In order to win the 10 free games available, you will need to get at least 3 scatter symbols that are represented by the logo of the game. During the free spins, there is the possibility to collect the Special Attack Moves that will appear on the 5th reel. When the round ends, you will enter the ring and this way you have the possibility to repeat the free games win. On top of that there is also the possibility to get 3 or more special attacks and this allows you to choose the Giant Signature Finishing Move and this way you can win a bonus prize at the end of the round. All this makes the free spins round entertaining and at the same time it can prove to be very profitable. The coin denomination for Andre the Giant starts from as little as $0.01 and this way you can bet up to $5 for each pay-line. Since there are 25 pay-lines the maximum bet allowed is worth $125 for each spin. 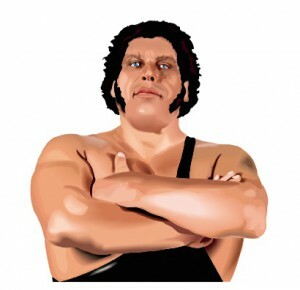 The Andre the Giant is an online video slot game where you have the opportunity to find more about the popular French wrestler who was 7’ and 4” tall. It’s a great honor for him to have a slot machine named after him and there are plenty of ways you can cash in some nice prizes. If you are a fan of Andre the Giant, or wrestling, or if you simply love to play the slots, it makes perfect sense to start playing this slot machine and you can be sure that it won’t disappoint you. The game is packed with a lot of action and there are plenty of ways you can start winning big and the wagers available can vary a lot, starting from $0.01 and going up to $125 for each spin. 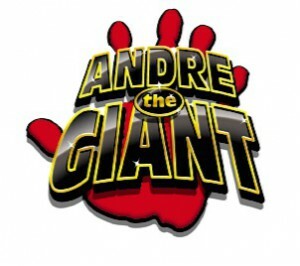 This way Andre the Giant slot can be considered to be an appropriate online slot machine for both casual players and professionals high rollers.